While preparing my big trip to South East Asia, I was looking for something different to do than the classical route through Thailand, Cambodia, Vietnam and Laos. When someone asked me ‘Why not try the Philippines! ?’, I got curious. With direct flights to Manila from Bangkok, Singapore, Kuala Lumpur and Australia, and even budget airlines flying there, the Philippines are within easy reach. Long story short, as soon as my plane touched down in Manila and I stepped out into the wild, I fell in love. You have never visited the Philippines before? Here are twelve reasons why you should go. Filipinos are the friendliest, most beautiful people I have ever met! They are always smiling and willing to help you. They love to sing and dance wherever they go, which is pretty interesting and not at least contagious. Everybody is so relaxed and chilled out, you cannot help but feel that way too. 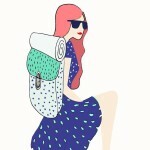 From laying on the beach to walking around the markets, everybody is laig back, and wants to laugh and chat with you. White sand that stretches for miles and miles, water so clear you can see the whole of the ocean bed. 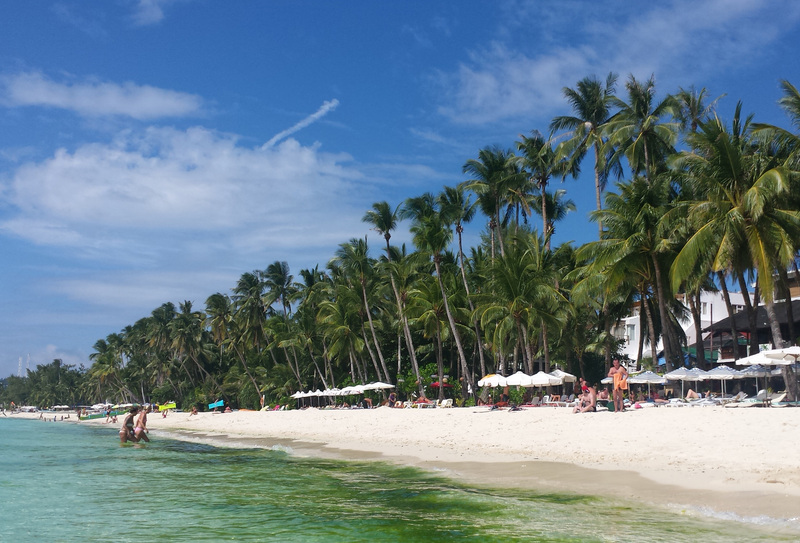 The Philippines consists of 7,107 islands, so it is not hard to find your own perfect, private beach. 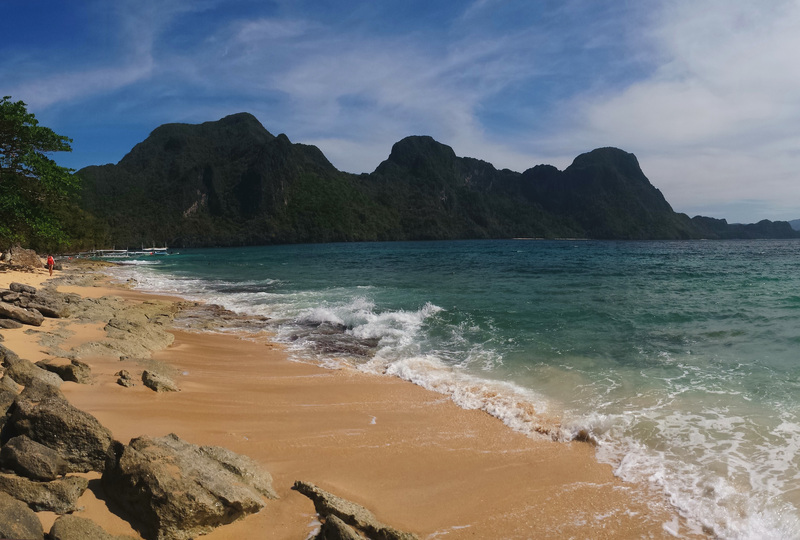 Island hopping in El Nido, Palawan takes you to the most isolated and picturesque beaches, and everywhere is so clean. I have not found one beach that did not blow me away. 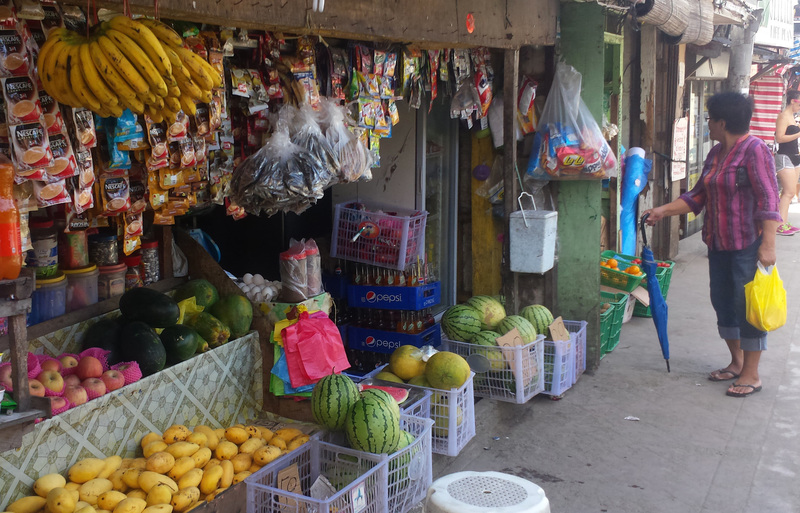 If you are into juicy mangoes and pineapples, the Philippines is the place for you. They are super cheap too, £0.50 for a mango and £0.80 for a pineapple. The bananas are perfect and you can buy them anywhere. With fruit like this it is hard not to eat healthy. Plus it counteracts all the delicious and cheap cakes available from the many bakeries. Where else can you get a chocolate cupcake for £0.12? 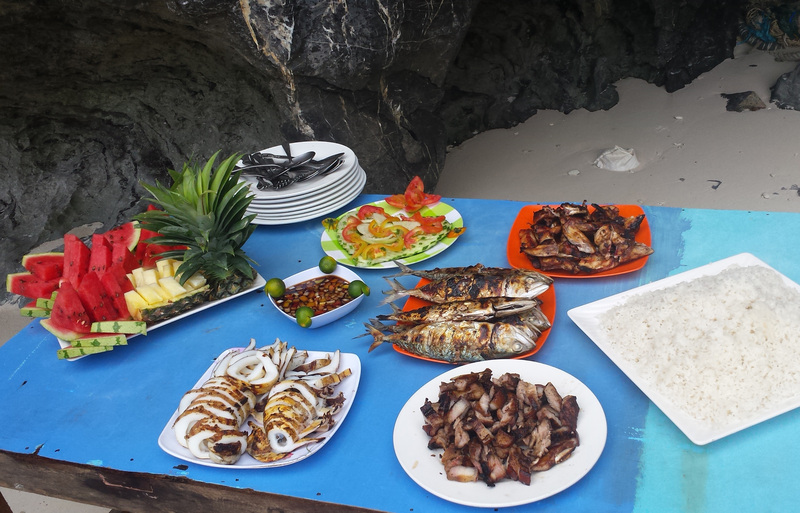 Red snapper, squid, lobster, crab – you name it, you can have it. Fresh and cooked to order for a fraction of the price you would pay in Europe. Most of the time it is hot and sunny, but never too hot. There is a nice breeze on the beaches and the average yearly temperature is 26 degrees Celsius (~79 F). November to April is peak season here and promises the best, driest weather. The local Boracay Rum comes in three delicious flavours, Cappuccino, Coconut and Melon, and at the bargain price of £2 a bottle. It tastes a bit like Malibu, and is pretty strong. You will need a lot of mixer! A bottle of Red horse beer is pretty strong too, 7% a bottle. You can usually find this for £0.80 in the shops. Happy Hour! The Philippines boasts more than 600 species of birds, 300 reptiles, 400 different kinds of corals and innumerable mammals. My favourite, the Philippine Tarsier, is one of the smallest, cutest species of monkeys in the world. People also come from all over the world to swim with the giant Whales Sharks and many other types of marine wildlife. It may not ave been the cheapest I have had in Asia (£5 for an hour, Indonesia was £3) but it was definitely the best. On the beach at sunset, I can officially say it was one of the best massages of my life. Over 90% of Filipinos speak English. This is always handy when travelling. English is the language used by the government, so most signs and any information you need can be found in English. The local form of transport is a great alternative. 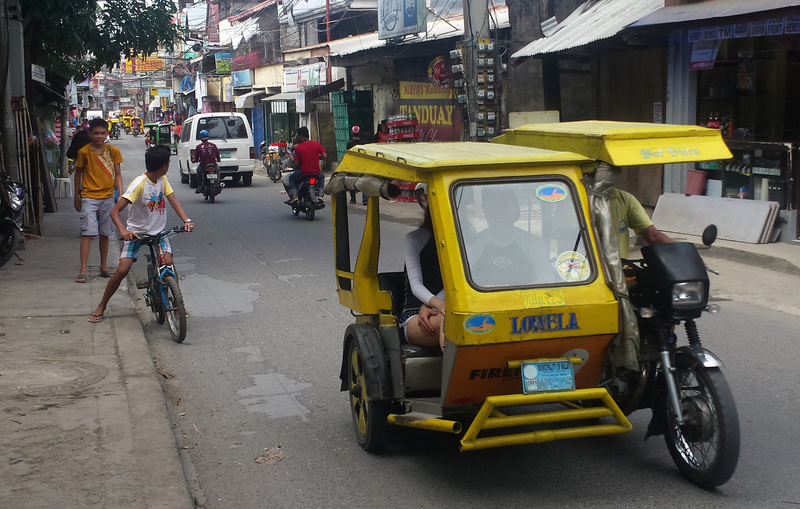 A tricycle is a motor bike with a large side cart attached – a slightly safer version of a motor bike taxi in my opinion. A Jeepney is a huge pickup truck – old military vehicles, left to the Filipinos by the Americans after WW2. They run along certain routes like buses and cost 7 Pesos (£0.12) a trip. 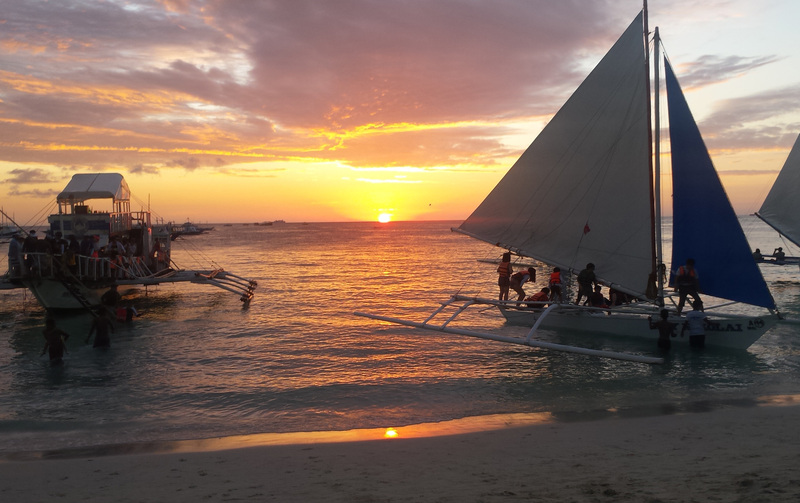 In my opinion the best thing about the Philippines is that it has not been destroyed by tourism. Although, there are street vendors and people trying to sell you sunglasses on the beach it is nowhere near as crazy as in other SEA destinations. Some places in the Philippines can be expensive but you can always find a cheap alternative. Just like other parts of Asia if you shop and eat local, you will pay the local price. The Philippines is a beautiful country full of beautiful people and places. I guarantee you will not be disappointed. I am sure I could easily come up with 12 more reasons. I cannot name my favourite country in the world as they are all amazing for different reasons, but if I had to make a list… The Philippines would definitely be near the top. *This is a guest post by Sally Munt, who blogs more about her adventure on her blog Sally Around the World. Great article! I nearly went there on my way back to the UK from Australia. I chose Latin America instead. While I don't regret that decision, I know I have to find a way to see the Philippines soon! Oh, man!! I want to go to the philippines sooo bad! Oh wow. I totally want to go there now! I am from the Philippines ,while I am living abroad , I would like to invite every body to visit my country. You will be surprise to know lots of good things . people are very courteous helpful. All over south Asia, sea food is so cheap and amazing that it makes you question all the money you spend in Europe!!! I cant wait to go there !!! The Philippines look so gorgeous! Definitely on my travel bucket list! I'm half filipino and I was so excited when I went to visit back in 2012! I fell in love with the country and I cannot wait to go back! Partially because I'm desperate to see my family again! Great post, I can't wait to make it to the Philippines. I loved Indonesia and that side of the world. Thanks for sharing this! As a Filipino who lives in the country, it was indeed wonderful reading an article like this that brings attention to a country that deserves the recognition it is now getting from travelers from all over the world. Comments like Zuzana's while sad, should not be given any weight because as it is with any country you travel to, if you are not cautious and do your research on your chosen city to visit, there is a chance you could experience what she did. If one were traveling to New York City, you wouldn't advise someone to not go there because you got mugged somewhere in Spanish Harlem. You would just tell them the spots to visit while in the area. And this piece achieves exactly that: why a first time traveler should come see our beautiful country and experience its equally warm people. .....omg....the pakwan is so red..
Hey! Wonderful article :) I was born in the Philippines and currently reside in NJ, US! My family just visited back to the home country this past November and I can relate and agree to everything written here! :) thanks for posting it!